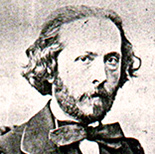 Édouard-Victoire-Antoine Lalo (January 27, 1823 – April 22, 1892) was a French composer. Lalo’s idiom is notable for strong melodies and colorful orchestration, with a rather Germanic solidity that distinguishes him from other French composers of his era. Such works as the Scherzo in D minor, one of Lalo’s most colorful pieces, might be considered appropriate embodiments of his distinctive style and strong expressive bent. It was not till his late forties that Lalo gained fame as a composer. Le roi d’Ys (The King of Ys), an opera based on the Breton legend of Ys, is his most complex and ambitious creation. (The same legend inspired Claude Debussy to compose his famous piano piece, La cathédrale engloutie.) The opera was rejected for 10 years after its composition and was not performed until 1888, when Lalo was 65 years old. He was made a knight (chevalier) of the Legion of Honour in 1880. He died in Paris in 1892, leaving several unfinished works, and was interred at the Père Lachaise Cemetery.